Ocean eddy cross-stream mixing estimates on constant density surfaces in the highly energetic eastward flowing mid-latitude North Pacific Kuroshio Extension (KE) were obtained from a largely eddy-resolving ocean general circulation model. These estimates were obtained over a four-year period during which the KE jet transitioned between a strong elongated state and a weak contracted state. The study documents the temporal and spatial eddy-mixing variability in and outside of the KE jet during this cycle; no study to date has documented eddy mixing over a complete energetics cycle of the KE jet. 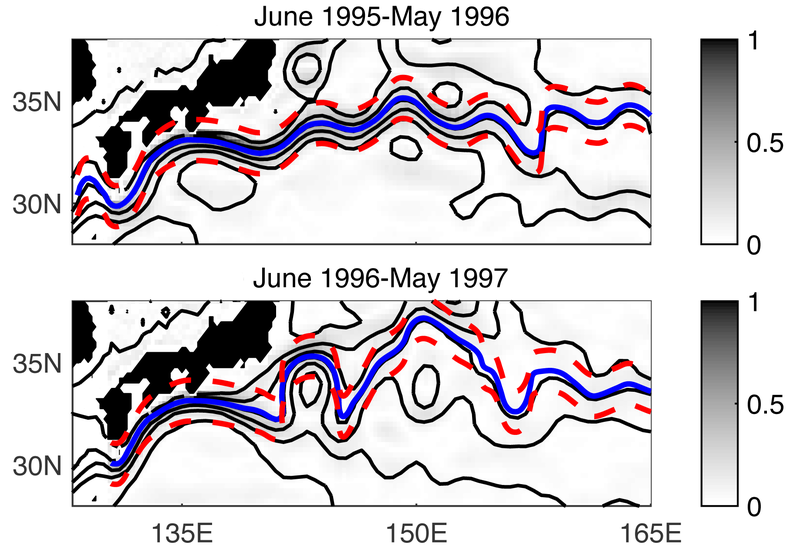 The Kuroshio Extension (KE) jet creates a strong front between the North Pacific subtropical and subpolar gyres and is known to fluctuate between energetic states on interannual/decadal time scales. Eddy mixing contributes greatly to the cross-frontal exchange of properties (e.g., heat, salt, carbon) that, in turn, impact the water mass compositions of the two gyres. The location of elevated cross-jet eddy mixing varies in the KE jet during the two states and likely plays a role in the variability of the amounts of central and subtropical mode water that form to the south of the KE front. These mode waters are responsible for the uptake of heat and salt by the ocean during winter and re-emerge in subsequent winters to impact North Pacific climate. The Kuroshio Extension (KE) is the eastward extension of the northward-flowing western boundary current of the North Pacific. It is intense in magnitude and is characterized by strong meanders and pinched-off mesoscale (~10-100 km) vortices. The cross-jet mixing in the KE displayed notable temporal variablility over a 4-year period during which the jet transitioned from its elongated strong (stable) state to its contracted weak (unstable) state. In the upper ocean, enhanced cross-jet mixing within the jet was concentrated in the downstream sector of the jet, where the jet was weak but eddy activity was strong. Elevated cross-jet mixing was found to the east of 150°E in the stable state and to the west of 150°E in the unstable state, consistent with the elongated (contracted) nature of the jet during its stable (unstable) state. However, average mixing within the KE jet was indistinguishable in the typical stable and unstable states. In the deep ocean, mixing is strongly influenced by topography, and thus horizontal mixing there has less interannual variability than in the upper ocean. Chen, R, ST Gille, and JL McClean. 2017. "Isopycnal eddy mixing across the Kuroshio Extension: Stable versus unstable states in an eddying model." doi:10.1002/2016JC012164.